When winter arrives and the sky is concrete grey and the ground is steel hard and white and the river seems to shiver....then....it is the time of the grayling. This fish is known as "the lady of the stream" and catching this beautiful creature on a frosty morning brings a feeling of warmth to every angler. The grayling has a streamlined body that is silvery blue and there is a scattering of dark coloured spots on both flanks. The most distinguishing feature of the grayling is the dorsal fin along its back. In comparison to the body, the fin is huge. When viewed in water the dorsal fin resembles the sail of a boat. Between the dorsal fin and the tail there is a small fleshy growth called the adipose fin. The adipose fin is also found on salmon and trout. Grayling are, in fact, a species member of the salmon family. However, the grayling prefers to spawn at the same time as coarse fish such as dace, chub, carp and roach. When it is the close season for salmon and trout there are no restrictions for grayling fishing. Grayling are not monster fish. The average weight is about .25kg and any fish approaching 1kg. would be considered a specimen. With its streamlined body and huge dorsal fin to aid it in strong currents, the grayling thrives best in fast flowing rivers and streams. Grayling have a poor tolerance for pollution and so having these fish in a river is an indication of good water quality. Grayling will feed and hunt in the same rapids and glides that trout inhabit. However, unlike trout, grayling swim in shoals. The best time to go for grayling is winter. Even though the temperature drops, and there is ice on the edges of the water, grayling will continue to feed. A basic float fishing rod is adequate for grayling fishing. Use a fixed-spool reel fitted with line of 3lb. breaking strain. Float fishing in rapids and stream is a popular method. Brightly coloured floats, such as crystal Avon, are better because they are highly visible in fast flowing water and can still seen at distance. Hook sizes ranging between 12 and 16 are suitable but make sure they are sharp enough to penetrate the hard mouth of the grayling. Barbless hooks are ideal because they make better purchase on the lip of the fish and they are much quicker and easier to remove. The natural diet of grayling consists of water snails, small crustaceans, flies and smaller fish. Float fishing with maggots, casters and worm is very popular. Redworms from compost heaps account for good sized grayling. When using maggots throw in extra with each cast and this will stimulate the fish into feeding. For many anglers fly-fishing is the first choice for catching quality grayling. To use this method a fly rod and fly reel fitted with fly line is needed. The classic pattern for winter fly-fishing is Red Tag. Grayling are predatory fish like the other members of the salmon family. They will hunt and take fry so have a go with spinning. The basic float rod can be used for spinning and choose a small Mepps spinner of silver or bronze. Grayling can often be caught in shallow water. 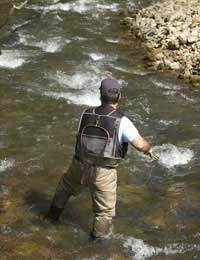 Tackle up away from the river and then approach the water without banging about because the fish will feel the vibrations. Keep a low profile against the skyline, or better still find a place where there are bushes behind you, and then try float fishing in the shallows close to the bank. When float fishing hold the line back at the end of the run. This will cause the bait to rise in the water and will attract fish. Don't expect to find grayling in the same place every day. Shoals of grayling will wander to different stretches of water so don't keep fishing in the same place for too long if nothing is happening....try a bit of wandering yourself!